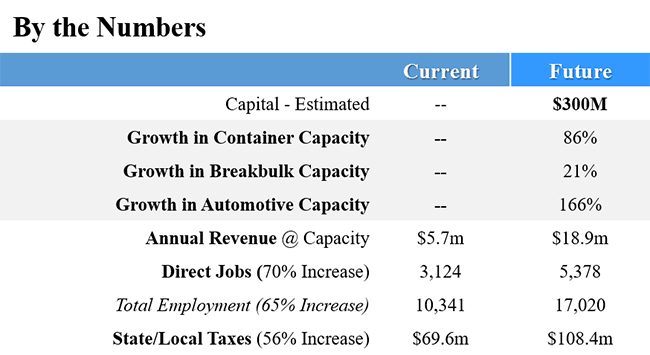 These improvements will result in doubling container capacity at the Port, provide increased breakbulk (non-containerized) cargo capacity, and bring a substantial increase in automobile-handling capacity. A total direct job increase of 70 percent is projected from the current level of 3,124 to a projected 5,378 direct jobs. Total employment at the Port will also increase, from 10,341 to 17,020, and state and local tax revenues generated will increase from the current $69.6 million to $108.4 million annually. The Port’s Automobile Import/Export facility, which currently processes 150,000 cars and employs more than 300 direct workers will also benefit by receiving about $90 million of the Governor’s Capital Investment program. Since 2010, Glovis America been the main customer of the Port’s Auto Processing facility, located in South Philadelphia adjacent to the Packer Avenue Marine Terminal, bringing Hyundai and Kia automobiles on vessels for eventual distribution to dealerships throughout the region. The Philadelphia Regional Port Authority (PRPA) is an independent agency of the Commonwealth of Pennsylvania charged with the management, maintenance, marketing, and promotion of publicly-owned port facilities along the Delaware River in Philadelphia, as well as strategic planning throughout the port district. PRPA works with its terminal operators to modernize, expand, and improve it facilities, and to market those facilities to prospective port users. Port cargoes and the activities they generate are responsible for thousands of direct and indirect jobs in the Philadelphia area and throughout Pennsylvania.